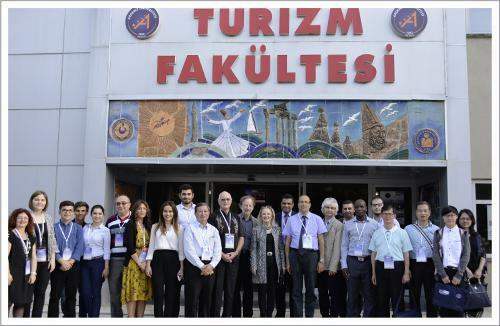 Approximately 80 academicians, students and tourism professionals from 8 countries attended the ‘’1st International Tourism Dynamics and trends’’ conference realized in 4-7 May by Akdeniz University Faculty of Tourism. Conferences and parallel sessions were made in 5 and 6 May within the context of the program. The Faculty of Tourism realized the organization in tandem with Kempten Applied Sciences University from Germany, Seville University from Spain and Sannio University from Italy. OTI Holding Chairman and member of World Tourism and Travel Council Ayhan Bektas attended the conference as the first speaker and presented his speech regarding ‘’The effect of some conjectural and political developments in the East Europe and Middle East regions on Mediterranean destinations which are the greatest tourism market’’. He emphasized in his speech that 1 billion 200 thousand people travelled all over the world in 2015. He stated that Continental Europe and Mediterranean are the most active regions with 600 million tourists and that the leadership of these regions is expected in the coming years too. In the opening speech, Associate Professor Tahir Albayrak stated that the conference will be held in Seville University next year and in Kempten Applied Sciences University in 2018. All rights reserved, © 2016 OTI Holding.